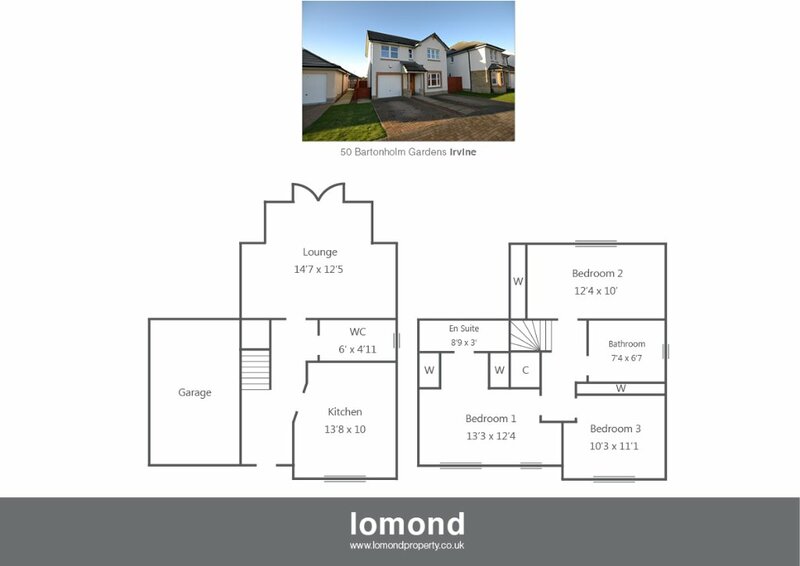 50 Bartonholm Gardens is a stylish modern villa offering everything the modern family seeks. Situated in the popular Fairways View development built 2014, the property has 5 years remaining of its NHBC warranty. Further benefits include off street parking, garage, and south facing gardens. In summary the property layout extends to a spacious and welcoming hallway with stairs to the upper level. To the rear of the ground floor the stylish modern lounge comes with French doors to the rear garden. The dining kitchen comes well stocked with integrated dishwasher, washing machine, gas hob, oven and hood. A WC completes the ground floor. The upper level houses three bedrooms, all of which are doubles and a family bathroom. The master bedroom benefits further from fitted wardrobe space and a luxury en suite shower room. Bedroom 2 and 3 also feature fitted wardrobes. The family bathroom is well presented with bath, WC and WHB, all finished to modern tiling. Externally the property has grounds to the front and rear. To the front there is off street parking, leading to an integrated garage. To the rear the garden is south facing. The garden is laid predominantly to lawn with a section of raised timber decking ideal for summer dining. Bartonholm Gardens is a pleasant residential area. Irvine town is close by and provides access to a range of amenities including supermarkets, bars, restaurants and town centre shopping. There are a number of local primary and secondary schools within the greater Irvine area.